A very pleasant referral from my old boss at Disney Consumer Products led me to Bridget and Patrick Larkin, two of the nicest clients a designer could ask for. They're world travelers who have a passion for sharing their stories and recommendations with others, so much so that they decided to build a travel website. Must Do Europe will be a great boutique destination site for those looking for travel tips, restaurant recommendations, and personal stories for many landmarks across Europe. I helped with the brand. Working with Bridget and Patrick on their brand was a blast. We began with exploring the personality they wanted their site to convey, along with identifying some clearly iconic elements from across Europe. 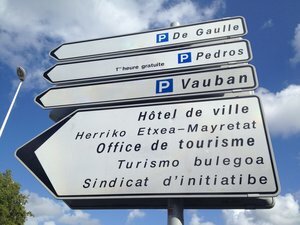 We landed on a concept of using common road signs from the streets of France as a main visual element, similar to these. From there, some typographic and color palette explorations later, we developed a whole brand, complete with guidelines for various layout and sizing requirements. Here's a sample of the final product. Aside from the brand, I was tasked with developing a wide assortment of icons for the site. The plan, which is currently in its final stages of development, is to have an interactive map of each country, all with icons of major landmarks that you could select to get more information. The challenge was developing a collection of icons that were similar in art style and color, but specific to the landmarks they represented. After some style explorations, a simple hand-drawn look with flat colors (able to be implemented as vector SVG files) was the direction Bridget liked the most. We created a total of 80 icons. Here is a sample of some of the earlier style options I presented to Bridget and Patrick. Keeping a cohesive design language across all icons was the main concern, so I was glad to present different options to make sure they were happy with the direction before developing the bulk of icons. It was a delight building this collection, and my experience working with Bridget and Patrick was super rad. So much so, that they've since kept me on retainer for all of their design needs for Must Do Europe.